There are a few events to share in September and if you can volunteer some time in Gloucester on September 3 or New Bedford on September 24 please CONTACT US. The 32nd annual Gloucester Schooner Festival will be September 2-4, 2016. Part of the festivities is the Maritime Heritage Day on Saturday September 3. Come to Gloucester, check out the SEMA table ( and maybe help out) and find out about the progress at the Shipyard. Check out some of the art! Stop by Gallery X and check out the art inspired by Schooner Ernestina-Morrissey. The Upper William St. Neighborhood Festival from noon until 4:00 PM on September 24 hosted by the Gallery and the First Unitarian Church of New Bedford. Ship Shape: Boats and Boatbuilding exhibit will also be a central feature of the Festival. During the festival the New Bedford Harbor Sea Chantey Chorus, begun as a Schooner Ernestina volunteer activity, will host Sea Music at Tryworks from 11:30am until 6:00pm in the auditorium of the First Unitarian Church parish house on Eighth St., New Bedford. Partially Funded by the Island Foundation and Friends and Members of Gallery X. During The Upper William St. 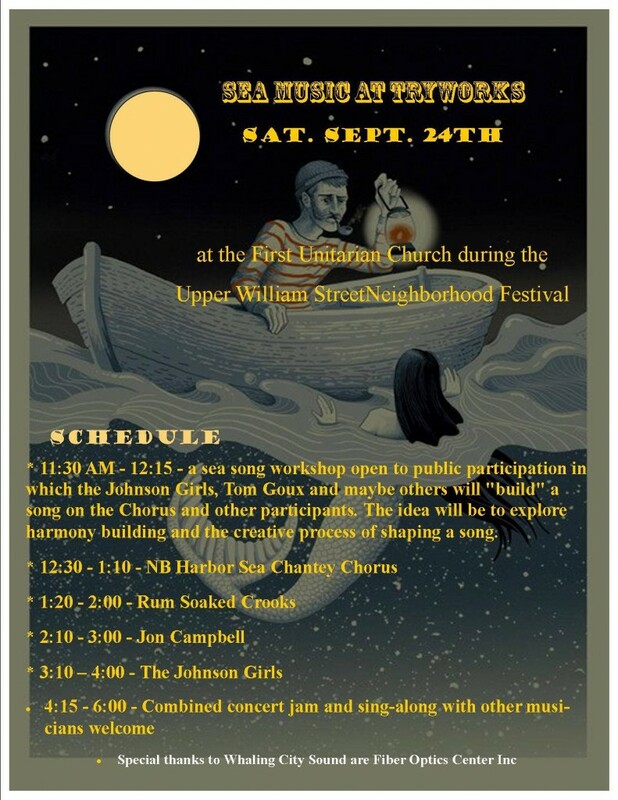 Neighborhood Festival the New Bedford Harbor Sea Chantey Chorus, begun as a Schooner Ernestina volunteer activity, will host Sea Music at Tryworks from 11:30am until 6:00pm in the Auditorium of the First Unitarian Church parish house on Eighth St., New Bedford. This entry was posted in Membership and Outreach Committee, News. Bookmark the permalink.